Sheila and I have been traveling in a motorhome for over 12 years; and one desire - or should I say "longing" of Sheila's has been to adopt a greyhound. I have never had a dog and hadn't really wanted one, although my experience over the last four years with Andrew, our rescued cat, has caused me to reconsider. Andrew has taught me so much about so many things, especially my capacity to love. He has opened my heart to four-legged creatures in ways that continue to amaze me. We are planning to move into a San Diego area home without wheels under it in September; and began considering a greyhound, but it seemed complicated. We would never take in a new "family member" without Andrew's okay, yet taking him to see a lot of dogs would only upset him. 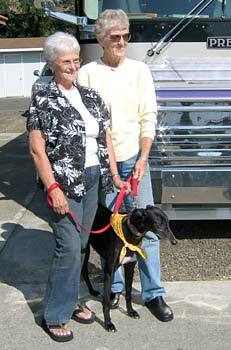 We brought our motorhome from California to the manufacturer's service center near Eugene, Oregon, for repairs on July 11, 2006 and saw a couple (Keith and Sally Woodcox) walk out of their motorhome with THREE greyhounds!!! We were excited (as usual) to go see the dogs, get a "greyhound fix," and meet the folks who had them. We ran to greet them, and all three dogs were friendly and happy to have the attention. I bent to my knees and talked to each one of them. I especially connected with the little black one, named "Hope." She stayed near me after I stood, leaning against my leg. It was love at first sight! Then, to my amazement, we learned that Hope was their foster dog, looking for a home. Later that day, we brought Andrew out on his leash to meet Hope, and got positive signs from both. Before the day was finished, we had filled out our adoption application, and it was on its way to GALT. Two days later, we parted with Hope to continue our trip to Seattle. Hope and her foster family went to Florence, Oregon, but Hope had captured our hearts and we all knew it would just be a matter of days before we would be a family. On July 28, 2006, our application was approved; all we had to do was get ourselves back to Florence for our reunion -- which we did. Hope has been with us for one week. She was shy at first, and missed her foster family. Already she is relaxing and gets more playful each day. She and Andrew have much to teach each other, and are becoming good friends. We'd like her to teach him how to walk a little faster on leash, and it'd be great if he'd show her how to use the litter box. Thanks so much GALT and Sally and Keith for making such a beautiful life possible for Hope, for us, and for all those lucky greyhounds!!! !